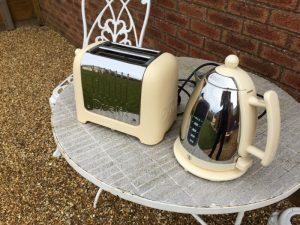 A cream and stainless steel retro style Dualit two slice toaster, together with a matching kettle. 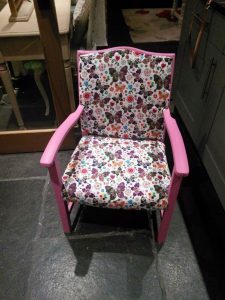 A hand painted hot pink, solid wood high back armchair, upholstered in butterfly patterned fabric. 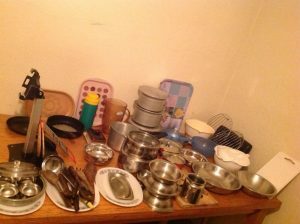 A large collection of kitchen accessories, to include stainless steel saucepans, utensils, oven trays etc. 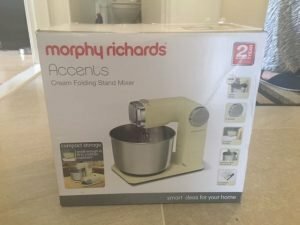 A brand new boxed cream and stainless steel Morphy Richards Accents folding stand mixer. 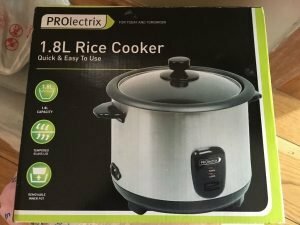 A brand new boxed stainless steel and black round 1.8 litre Prolectrix rice cooker. 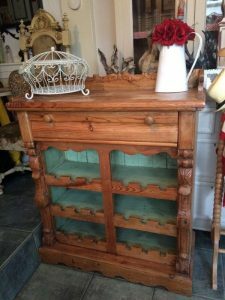 A rustic style tall heavily carved solid pine kitchen rack in the farmhouse style, having a large drawer above six wine rack shelves. 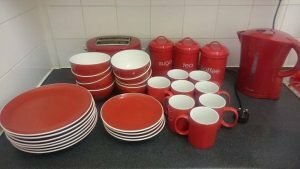 A collection of red kitchen accessories, to include a kettle, a two slice toaster, a dinner set and tea, coffee and sugar canisters. 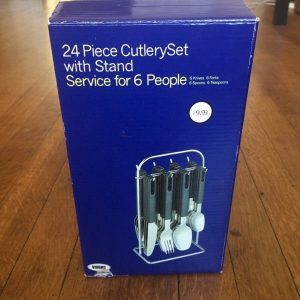 A brand new boxed twenty four piece black and stainless steel cutlery set and stand. 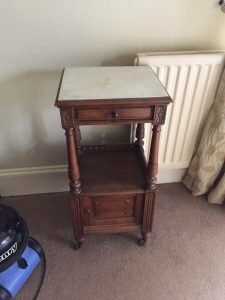 A tall standing heavily carved marble topped, solid oak side table on castors, having a small drawer above a cupboard. 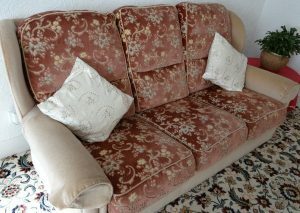 A three seater high back vintage sofa, upholstered in cream and floral patterned red velour. 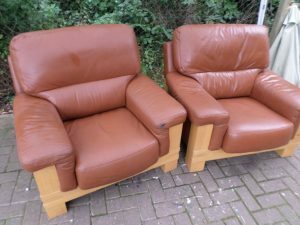 A pair of vintage high back armchairs on solid pine bases, upholstered in terracotta faux leather. 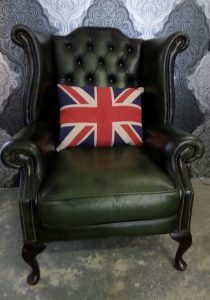 A vintage wing back Chesterfield armchair on mahogany legs, upholstered in green authentic leather. 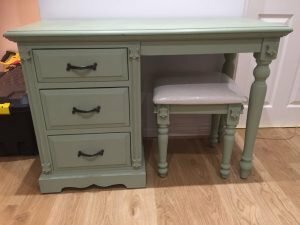 A hand painted pale green solid wood three drawer desk, together with a matching square stool. 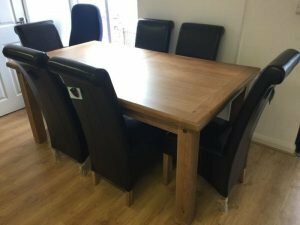 A solid oak rectangular extendable dining table, together with six high back dining chairs, upholstered in black faux leather. 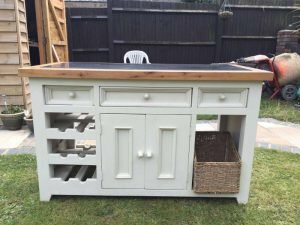 A hand painted solid pine vintage kitchen dresser, having three drawers above a double cupboard, three wine shelves and a wicker drawer. 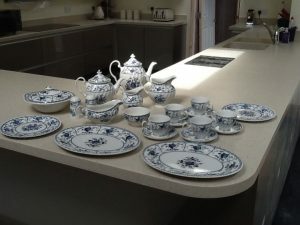 A vintage fine bone China blue floral patterned tea set, to include two teapots, two milk jugs, a gravy bowl, salt and pepper shakers, teacups, saucers etc. 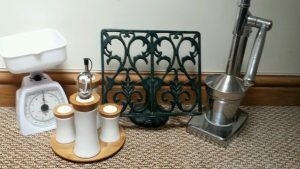 A small collection of kitchen accessories, to include a cast iron book rest, a set of scales, a pine and ceramic condiment set and a juicer. 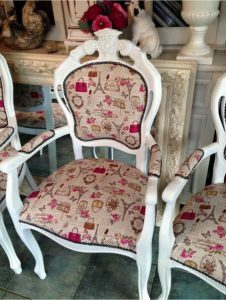 A set of four hand painted white high back dining chairs, upholstered to the seats, backrests and armrests in paris themed fabric. 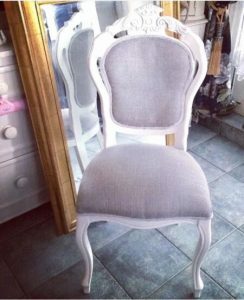 A small hand painted white carved back bedroom chair, upholstered to the seat and backrest in grey velour. 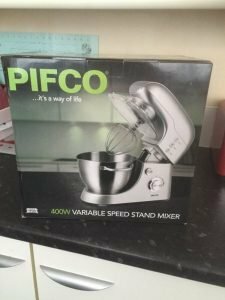 A brand new boxed Pifco stainless steel 400w variable sped stand mixer.